Here at ChiIL Mama and ChiIL Live Shows, it's our great pleasure to partner up once again with The House Theatre of Chicago on a ticket giveaway for our readers. The House has a well deserved national reputation for epic productions and amazing feats of storytelling. They've long been favorites of ours and we make it a point to catch every show they mount. Whether you've never seen one of their shows or you're a regular, take a few minutes to enter at the bottom of this post, and you may be one of two lucky winners to enjoy a show "on the house". 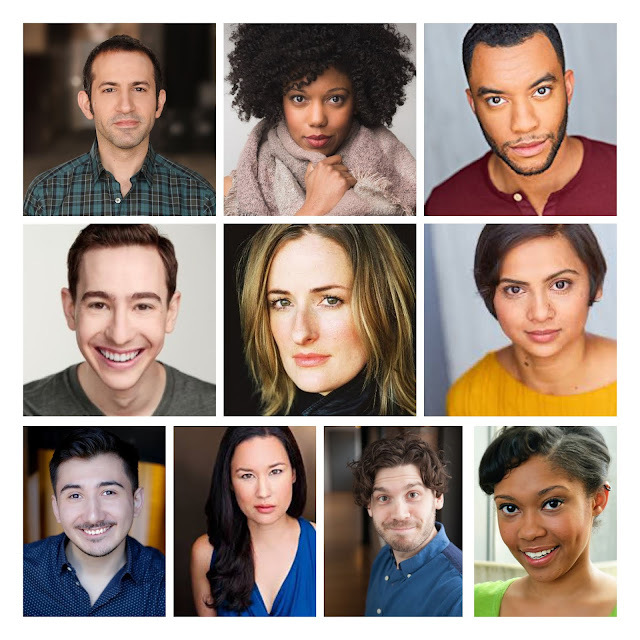 The House Theatre of Chicago is proud to announce casting and the production team for the company’s season opener, Borealis. 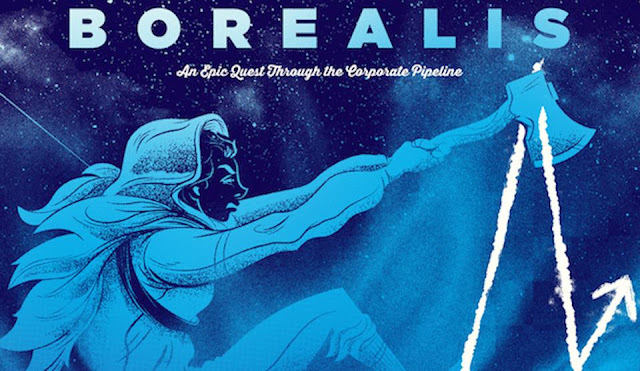 Director Monty Cole helms the professional premiere of playwright Bennett Fisher’s epic adventure through the corporate guts of Big Oil. Borealis runs August 30 through October 21 at Chopin Theatre’s Upstairs Theater, 1543 W. Division St., Previews begin Thursday, August 30 and play through Friday, September 7. Opening/press night is Saturday, Sept. 8 at 8 p.m. The performance schedule is Thursdays - Saturdays at 8 p.m. and Sundays at 3 p.m. (September 23 and October 7) or 7 p.m. (September 9, September 16, September 23, October 14 and October 21). Preview tickets are $20 and regular run tickets range from $30 to $50. $20 same-day tickets for students and industry professionals are available for all dates, seats permitting. For more information and to purchase tickets, please visit www.thehousetheatre.com or call 773.769.3832. When a redacted and ominous letter arrives from her brother on the oil fields, thirteen-year-old Cozbi sets off for Anwar, Alaska to find him. Armed with a book on corporate communication strategy and a sharp axe, Cozbi battles her way through an Arctic wilderness in pursuit of her missing brother. But she'll have to face more than a multi-tentacled HR rep to learn the truth. Part mythic journey, part workplace satire, Borealis is a dark and funny adventure about family obligation, career aspiration and what we leave behind to make our way to the top. 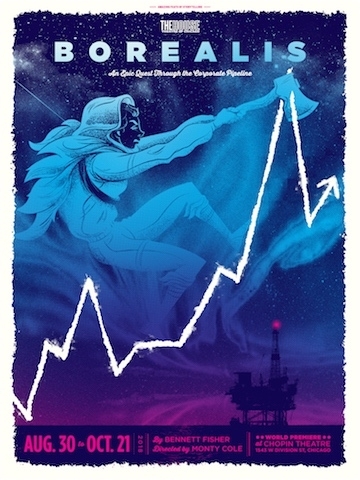 Cozbi’s search-and-rescue tale to the inner workings of Big Oil travels between mundane cubicles crawling with monstrous executives to desk-jockeys trapped by the dangerous ice-bound surround and out to the slick, sea-soaked rigging platforms. The House employs an immersive design with huge pipelines traversing up, around and behind the audience creating unique pathways and playing spaces for actors. The cast of seven includes three House Company Members: Paige Hoffman+, Johnny Arena+, and Ben Hertel+. Returning guest artists include Desmond Gray (The Nutcracker, Hatfield & McCoy) and Tia Pinson (Hatfield & McCoy) as brother and sister, as well as new guest artists McKinzie Chinn and Karissa J. Murrell Myers*. The understudies are Madhura Jugade, Juan Munoz, and Oly Oxinfry. The Production and Design team includes Eleanor Kahn, scenic designer; Izumi Inaba^, costume designer; Lee Keenan+^, lighting designer; Sarah Espinoza, sound designer; Matthew Muñiz+, composer; Ellie Terrell, properties designer; Breon Arzell, choreographer; Gaby Labotka, fight choreographer; Abhi Shrestha, assistant director and Amalie Vega*, stage manager. Bennett Fisher is an artistic associate and former Shank Fellowship Playwright in Residence at Victory Gardens Theater in Chicago and a company member of Campo Santo and People of Interest and the Cutting Ball Theater. His other plays include Damascus (recently presented by Strawdog in Chicago, Samuel Goldwyn Award, O'Neill Conference finalist), Don't Be Evil, Candlestick, Campo Maldito, and the dialogue for the immersive theater experience The Speakeasy, currently running in San Francisco. His work has been presented and produced by the Bay Area Playwrights Festival, Strawdog Theater Company, La Jolla Playhouse's WOW Festival, the Alliance Theater, the Kennedy Center MFA Playwrights Workshop, Florida Repertory Theater, the Martin E. Segel Center, Burbage Theater Company, People of Interest, Ubuntu Theater Project, Theater Emory, the Unicorn Theater, Sleepwalkers Theater, New Conservatory, the Cutting Ball Theater, Custom Made Theatre Company, and others. Fisher has been commissioned by The House Theater of Chicago, Theater Emory, Campo Santo, and others. His screenplay version of Damascus was optioned by Bill Mechanic and Pandemonium and he is currently developing work with e1 based on the experience of the former CIA officer-turned-whistleblower John Kiriakou. As an actor, dramaturg, and director, he has collaborated with California Shakespeare Theatre, Stanford Summer Theatre, Just Theater, Crowded Fire, Pear Ave Theatre, Adirondack Shakespeare Company, Marin Shakespeare Company, and many others. He received his MFA from UC San Diego in 2016. Monty Cole is a director based out of Chicago and Los Angeles. Cole has directed for The Goodman Theatre, The Alley Theatre, Victory Gardens Theater, American Theatre Company, Definition Theater Company/ALTA, The House Theatre of Chicago, the Chicago Theater Marathon, California Institute of the Arts and others. Cole directed the critically acclaimed and Jeff Award winning production of The Hairy Ape for Oracle Productions. Cole is working with collaborator and choreographer Breon Arzell on revitalizing In Dahomey, the first black written and performed Broadway musical from 1903 for the Center for New Performance. Recently, Cole directed William Shakespeare's Hamlet at The Gift Theatre and Kiss by Guillermo Calderon at the Haven Theatre Company. Cole is currently finishing his MFA Directing degree at the California Institute for the Arts. The House was founded in 2001 by a group of friends to explore connections between Community and Storytelling through a unique theatrical experience. 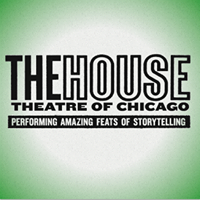 Since becoming eligible in 2004, The House has been nominated for 70 Joseph Jefferson Awards (22 wins), became the first recipient of Broadway in Chicago’s Emerging Theater Award in 2007, and was awarded a 2014 National Theatre Company Grant by the American Theatre Wing, founder of the Tony Awards. The 17th season of original work will begin with Borealis in the fall of 2018 and The House will continue its mission to unite Chicago in the spirit of Community through amazing feats of Storytelling. Winners will be chosen at random and announced here and via our social media outlets on September 7th. Winners will also be e-mailed. Enter early and often through midnight September 6th. Disclosure: Thanks to House Theatre for providing tickets for our giveaway and for review purposes. As always, all opinions are my own.